Location The hotel offers an exclusive location by the beach of BÃ¡varo. The transfer time to the Punta Cana Airport is around 35 minutes. Facilities The complex was built in 2001. Guests are welcomed at the hotel, which has a total of 504 rooms. A lobby and a reception are available to travellers. Amenities include a currency exchange service and a cash machine. Wireless internet access in public areas (for a fee) allows guests to stay connected. Among the culinary options available at the accommodation are a restaurant, a dining area and a bar. Various shops are available, including a souvenir shop. The grounds of the complex feature a playground and an attractive garden. Additional facilities at the complex include a playroom. Travellers arriving by car can leave their vehicles in the garage or in the car park. Additional services include a babysitting service, medical assistance, room service, a laundry service and a hairdresser. Rooms Each of the rooms is appointed with air conditioning, a living room and a bathroom. Most rooms feature a balcony with a view for guests' enjoyment. Most of the accommodation units offer a sea view. The rooms have a double bed, a queen-size bed or a king-size bed. Cots are available for younger guests. A safe, a minibar and a desk are also available. Additional features include a mini fridge and a tea/coffee station. An ironing set is also available for travellers' convenience. Little extras, including internet access, a telephone, a TV and WiFi (no extra charge), contribute to a great stay. Slippers are laid out in each of the rooms. The bathrooms are fitted with a shower, a bathtub and a hot tub. A hairdryer and bathrobes are provided for everyday use. Sports/Entertainment The hotel offers an outdoor pool and a children's pool. A waterslide offers fun for all ages. Sun loungers on the sun terrace offer an inviting place to relax. The hot tub is the perfect place to relax. The poolside bar serves a selection of refreshing drinks. A variety of sporting activities, such as biking/mountain biking, tennis, bocce, beach volleyball, volleyball, basketball and archery, or for a fee, horse riding, are offered at the accommodation. Guests at the complex can choose from a range of water sports options, such as catamaraning, snorkelling and aquafit, or for a fee, water skiing, windsurfing, jet skiing, banana boat rides and diving. The complex also offers sports enthusiasts a wide range of indoor activities, including a gym, table tennis, badminton, billiards, yoga and aerobics. A wellness area with a spa, a beauty salon and massage treatments is available at the hotel. Other options and services include an entertainment programme, a disco, a kids' club, a casino and a nightclub. Meals All-inclusive is bookable. Available meals include breakfast, lunch and dinner. Snacks can be enjoyed at the accommodation. Options include alcohol-free drinks and alcoholic beverages. Payment The following credit cards are accepted in the complex: VISA and MasterCard. Sivory Punta Cana Boutique Hotel has transformed a stretch of private beach and lush vegetation into a soothing paradise. A serene Polynesian-inspired oasis has emerged along the golden sands of the Eastern shore of the island, incorporating unobtrusive but stylish accommodations, facilities and amenities. The 55 suites are spacious, comfortable and well appointed with emphasis, relaxation and nature. Some of the suites are oceanfront and feature personal plunge pools or outdoor showers. Accommodations feature a king-size bed, large and elegant dressing areas and spacious baths that feature double multiple-jet showers with glass doors and oversized soaking tubs enveloped in coral tile. Intimate sitting areas in the guestrooms offer all of the amenities of home. Modern day touches such as Plasma screen TV, compl. Wi-Fi internet, CD/DVD player, compl. mini-bar, tee/coffee maker and a wine cooler stocked with a few vintages from the resortâ? ?s extensive collection. Full-size ETRO amenities are also provided in guestrooms. The fine dining restaurants at Sivory Punta Cana were carefully designed to reflect the culture and cuisine served at each. Laveranda Restaurant offers a delectable Mediterranean cuisine while Tau offers a tantalizing Asian fusion fare and features an intimate dining setting with eight tables and trendy Asian-inspired dÃ©cor. Gourmond, the most elegant of the three and awarded with 4 Diamonds AAA, is designed and furnished to reflect the delicious international cuisine. In keeping with the multi-cultural theme of design, European flair was included and resulted in the creation of what is considered to be the most extensive wine collection in the Caribbean of 8,000 bottles of the finest vintages from around the world. The Sivory Meal Plan is available for purchase at the property, please inquire at Check-In for more details and price. No place is the core design goals and objectives evident than in the spa Aquarea â?? a complete wellness facility that combines the natural essences indigenous to the area with revolutionary treatments and therapies. An island of sensations awaits you at Sivory Punta Cana. Laveranda Restaurant Treat yourself to the very best in Mediterranean cuisine. Feel the breeze of the beach and the touch of the golden sand while you savor an exquisite meal on your restaurant terrace. Enjoy real works of food art just for gourmands. Lose yourself in an ocean of flavors Gourmond Restaurant The crÃ¨me de la crÃ¨me. A restaurant specializing in french and international cookery. Try our nouvelle cuisine and be amazed at the dishes and combinations that you could never have dreamed up. Fine, sophisticated and exquisite cuisine. An indescribable pleasure. Bon appetite! Gourmet Specialities and wine cellar stocked with 8,000 wines. Tau Restaurant A culinary masterpiece. A top restaurant reserved for genuine luxury-seekers. Take a seat at one of this eight tables and let your chef surprise you with his extraordinary delicacies. The finest fusion of Asian flavors. Cigar Lounge Make yourself at home in one of the lounge armchairs and light up a cigar. Youâ? ?ll soon feel how time stands still and stress disappears as if in a puff of smoke. At our Cigar Lounge you can find the best selection of cigars, some of which are genuine collectorâ? ?s items. Art for smokers. Location This beach hotel is an oasis of seduction and serenity in Uvero Alto, Dominican Republic, along a private white sandy beach, offering a tropical hideaway where privacy is paramount. 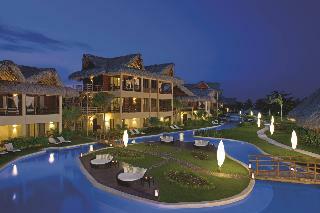 The aparthotel is just 45 km from the Punta Cana International Airport and 100 km from La Romana International Airport. Facilities This apartment hotel was built in 2006. The hotel offers travellers a total of 51 rooms. Amenities include a currency exchange service. Wireless internet access in public areas allows guests to stay connected. Among the culinary options available at the accommodation are a restaurant, a dining area, a breakfast room, a cafÃ© and a bar. Various shops are available, including a souvenir shop. There is also a garden. Those arriving in their own vehicles can leave them in the car park of the apartment hotel. Additional services include a babysitting service, room service, a laundry service and a hairdresser. Rooms The hotel features rooms with air conditioning, a fan, a living room, a kitchen and a bathroom. The basic features of most rooms include a balcony. Many rooms feature a sea view, which further enhances the ambience. The rooms have a double bed, a queen-size bed or a king-size bed. A safe and a minibar are also available. Guests will also find a tea/coffee station included as standard. An ironing set is also available for travellers' convenience. Little extras, including internet access, a telephone, a TV, a CD player, a DVD player and WiFi (no extra charge), contribute to a great stay. Slippers are laid out in each of the rooms. The bathrooms are fitted with a shower, a bathtub and a hot tub. A hairdryer, a vanity mirror and bathrobes are provided for everyday use. The accommodation offers non-smoking rooms. Sports/Entertainment The apartment hotel features a pool and an outdoor pool. A sun terrace, sun loungers and parasols are also available. The hot tub is the perfect place to relax. The poolside bar serves a selection of refreshing drinks. Variety is provided by the wide range of sporting activities offered at the hotel, for example tennis, golf, fishing and horse riding. A wide range of sports are available, including water sports such as windsurfing, kitesurfing, kayaking, snorkelling and diving, or for a fee, jet skiing. The accommodation also offers sports enthusiasts a wide range of indoor activities, including a gym, billiards, yoga and aerobics. A spa, a sauna, a steam bath, a beauty salon, hydrotherapy applications and anti-ageing treatments are among the wellness options offered. For an additional fee, massage treatments are also available. Guests can enjoy live music in the evening. Meals Catering options available at the apartment hotel include bed and breakfast and all-inclusive. Breakfast, lunch and dinner are available. Gluten-free meals and vegetarian dishes can be prepared on request. The hotel also offers snacks. Options include alcohol-free drinks and alcoholic beverages. Payment The following credit cards are accepted at the accommodation: VISA and MasterCard. Location This hotel lies in wonderfully lush surrounds just 25 minutes from Punta Cana international airport and within a short distance of BavarÃ³ Beach. Facilities The resort was built in 2000. Travellers can enjoy a pleasant stay in one of the 355 rooms. A lobby and a reception are available to guests. Services such as a safe and a cash machine ensure a comfortable stay. Wireless internet access is available to travellers in the public areas. Among the culinary options available at the holiday complex are a restaurant and a bar. Various shops are available, including a supermarket and a souvenir shop. The grounds of the accommodation feature a playground and an attractive garden. Additional facilities at the complex include a playroom. Guests arriving by car can leave their vehicles in the garage or in the car park. Additional services include multilingual staff, a babysitting service, a childcare service, medical assistance, room service, a laundry service and a hairdresser. In addition, a shuttle service is offered. Active guests can make use of the bicycle hire service (for a fee) to explore the surrounding area. Rooms Each of the rooms is appointed with air conditioning, a fan, a kitchen and a bathroom. Most rooms feature a balcony with a view for guests' enjoyment. The rooms have a double bed, a queen-size bed or a king-size bed. Separate bedrooms are also available. Cots are available for younger travellers. A safe and a minibar are also available. Guests will also find a tea/coffee station included as standard. An ironing set is also available for guests' convenience. Other features include internet access, a telephone, a TV and WiFi (no extra charge). The bathrooms have a shower, a bathtub and a hot tub. A hairdryer can also be found in each of the bathrooms. Sports/Entertainment The resort offers an outdoor pool and a children's pool. The sun loungers and parasols on the sun terrace offer a great place to unwind. The hot tub is the perfect place to relax. A poolside snack bar is available. Variety is provided by the wide range of sporting activities offered at the holiday complex, for example biking/mountain biking, tennis, bocce, beach volleyball, volleyball, basketball, crazy golf and archery. Many sports options are available, including water sports such as windsurfing, banana boat rides, canoeing, sailing, catamaraning, kayaking and snorkelling. For a fee, jet skiing and diving can also be enjoyed. The accommodation also offers sports enthusiasts a wide range of indoor activities, including a gym, table tennis, billiards, darts, gymnastics and aerobics. A range of wellness facilities, such as a sauna, a steam bath, a beauty salon and Ayurveda applications are offered bringung","addData":}. For a fee, travellers can also take advantage of a spa and massage treatments. Leisure facilities include an entertainment programme, a disco, a kids' club, a kids' disco, a casino and a nightclub. Meals All-inclusive is bookable. Breakfast, lunch and dinner are available. The complex also offers snacks. The chefs prepare delicious specialities during the show cooking. The drinks selection includes alcohol-free drinks and alcoholic beverages. Payment The following credit cards are accepted at the resort: VISA and MasterCard. Location This hotel is located on the beach of Playa Bavaro. The airport of Punta Cana is about 20 km away whilst the Plaza Bavaro with its countless shops, bars, restaurants, clubs and pubs as well as various other entertainment venues is only 20 minutes walk from the hotel. The hotel grounds are part of the large Princess complex. Facilities This hotel was built in 1998. Travellers are welcomed at the establishment, which has a total of 310 rooms. Guests are welcomed at the reception in the lobby, which offers a 24-hour check-out service. Amenities include a safe and a cash machine. Wireless internet access is available to travellers in the public areas. Various gastronomic options are available, including a restaurant, a dining area, a cafÃ© and a bar. Various shops are available, including a supermarket and a souvenir shop. The grounds of the accommodation feature a playground and an attractive garden. Additional facilities at the hotel include a playroom. Guests arriving by car can leave their vehicles in the garage or in the car park. Available services and facilities include multilingual staff, a babysitting service, a childcare service, medical assistance, room service, a laundry service and a hairdresser. In addition, a shuttle service is offered. Active guests can make use of the bicycle hire service to explore the surrounding area. Rooms Each of the rooms is appointed with air conditioning, a fan, a kitchen and a bathroom. Most rooms feature a balcony with a view for guests' enjoyment. The rooms have a double bed, a queen-size bed or a king-size bed. Separate bedrooms are also available. A safe and a minibar are also available. A fridge and a mini fridge ensure a comfortable stay. Internet access, a telephone, a TV and WiFi (no extra charge) add to the comfort of the holiday. The bathrooms are fitted with a shower and a bathtub. A hairdryer can also be found in each of the bathrooms. Special family rooms are available for families with children. Sports/Entertainment The establishment offers an outdoor pool and a children's pool. A sun terrace, sun loungers and parasols are also available. The hot tub is the perfect place to relax. A poolside snack bar is available. Variety is provided by the wide range of sporting activities offered at the accommodation, for example biking/mountain biking, tennis, bocce, beach volleyball, volleyball, basketball, crazy golf, archery and horse riding. Travellers at the hotel can choose from a range of water sports options, such as windsurfing, sailing, catamaraning, kayaking and snorkelling, or for a fee, water skiing, banana boat rides and diving. The establishment also offers sports enthusiasts a wide range of indoor activities, including a gym, table tennis, billiards and aerobics. Various wellness options are available at the accommodation, including a spa, a sauna, a beauty salon and massage treatments. Leisure facilities include an entertainment programme, a disco, a kids' club, a kids' disco, a casino and a nightclub. Meals Catering options available at the hotel include bed and breakfast and all-inclusive. Breakfast, lunch and dinner are available. The establishment also offers snacks. Options include alcohol-free drinks and alcoholic beverages. Payment The following credit cards are accepted at the accommodation: VISA and MasterCard. Location This luxury hotel is located directly beside the kilometre-long sandy beach in the Bay of BÃ¡varo on the east coast of the Dominican Republic. Located close by is a shopping centre and it is 25 minutes to Punta Cana International Airport whilst La Romana Airport lies 1.5 hours away. Facilities The resort was built in 1991. The holiday complex offers travellers a total of 808 rooms. A lobby and a reception are available to guests. Services such as a safe and a cash machine ensure a comfortable stay. Wireless internet access (for a fee) is available to travellers in the public areas. Various gastronomic options are available, including a restaurant, a cafÃ© and a bar. Various shops are available, including a supermarket and a souvenir shop. The grounds of the accommodation feature a playground and an attractive garden. Additional features at the complex include a newspaper stand and a playroom. Guests arriving by car can leave their vehicles in the garage or in the car park. Available services and facilities include multilingual staff, a babysitting service, a childcare service, medical assistance, room service, a laundry service and a hairdresser. In addition, a shuttle service is offered. Rooms Each of the rooms is appointed with air conditioning, a fan, a living room, a kitchen and a bathroom. Most rooms feature a balcony with a view for guests' enjoyment. The rooms have a double bed or a king-size bed. Separate bedrooms are also available. A safe and a minibar are also available. Guests will also find a tea/coffee station included as standard. An ironing set is also available for travellers' convenience. Other features include internet access, a telephone, a TV, a DVD player and WiFi. Slippers are laid out in each of the rooms. The bathrooms have a shower, a bathtub and a hot tub. A hairdryer and bathrobes are provided for everyday use. Sports/Entertainment The resort offers an outdoor pool and a children's pool. The sun loungers and parasols on the sun terrace offer a great place to unwind. The hot tub is the perfect place to relax. There is also a poolside snack bar. A variety of sporting activities, such as tennis, bocce, beach volleyball, volleyball and archery, or for a fee, fishing, are offered at the holiday complex. Golf is organised by third-party operators. A wide range of sports are available, including water sports such as windsurfing, paddle boating, banana boat rides, sailing, catamaraning, kayaking, diving and aquafit, or for a fee, snorkelling. The accommodation also offers sports enthusiasts a wide range of indoor activities, including a gym, table tennis, darts and aerobics. A range of wellness facilities, such as a spa, a sauna, a steam bath and Ayurveda applications are offered bringung","addData":}. For a fee, guests can also take advantage of a beauty salon and massage treatments. Other options and services include an entertainment programme, live music, a disco, a kids' club, a kids' disco, a casino and a nightclub. Meals All-inclusive is bookable. Breakfast, lunch and dinner are available. The complex also offers snacks. The resort offers alcohol-free drinks and alcoholic beverages. Payment The following credit cards are accepted in the holiday complex: American Express, VISA and MasterCard.